The event will feature a host of workshops and seminars, and community resources that are specifically designed to aid parents in supporting their student’s success. This event is free, and transportation is being provided from each school in the district to the location. 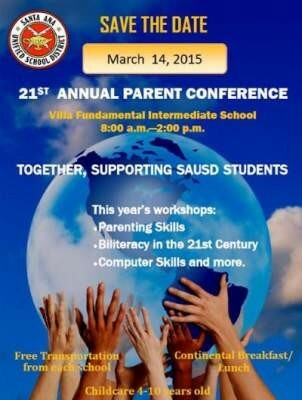 Please visit the Santa Ana Unified School District website at www.sausd.us for pick up times. Childcare will be available for children ages 4 to 10 years old, and a continental breakfast and lunch will be available to children and all participants. The conference is from 8:00 a.m. to 2:00 p.m. Transportation will also be available to parents who wish to be transported from their school site to Villa Fundamental Intermediate School, located at 1441 East Chestnut Avenue.